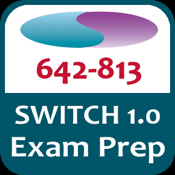 Pass the SWITCH Certification Test -642-813-Multiple Choice and Flashcard Mode - Built in Answer Key - Integrated Learning Partner Course Material -The first part of the CCNP Certification. This Cisco Authorized Exam Prep is the same one that has been used by over 50,000 Cisco and Cisco Partners for their Certification Studies. This is the ONLY Authorized SWITCH Content on an iPhone, Study the Best content from the Cisco Learning Partner Program. This is a proven study track for success!! Don’t waste your time. Study the same information used by Cisco. Tech 2000, a Cisco Learning Solutions Partner is proud to bring you the most Comprehensive SWITCH Exam Prep available . Based on the concept of Assessment Based Learning, It combines Cisco Authorized Assessments with a Powerful Assessment Based Learning Engine to provide you with the most Effective Learning Environment available. The System will also help you study by identifying your weaknesses using the Patented Relevance Engine. It will automatically create a Learning Plan for you as well as guide you to Instructor Led training. Relevance Engine- A patented system that allows a selection of the appropriate content based on the users performance as it relates to the hierarchy of the learning objectives. -Provides Users with Multiple choice, True False Questions, randomized and delivered in selected Topic and Quantity. Provides Users with 2 Modes to Study their training content. -Study Mode allows a user to proceed directly Comprehensive Graphics , Text, URL links to enhance your Learning experience. -Review Mode allows the Engines Prescriptive and Relevance feature to be utilized. In this mode a users performance on the Practice Engine will spawn a Lesson Plan based on their individual Knowledge-gaps.